June in London was a tale of two stories: Prince Harry and Meghan Markle’s wedding, and the less glamorous, but no less consuming launch of the EU’s General Data Protection Regulation (GDPR). While the former did provide a sizeable boost to the economy, the latter kicked off financial services hiring that is expected to impact the months ahead. “Apart from a break to watch the royal wedding, the month of May was all about GDPR compliance”, said Hakan Enver, Managing Director, Morgan McKinley Financial Services. “Hiring in technology, compliance and legal departments was astronomical. GDPR, a regulation in EU law on data protection and privacy for individuals within the EU, is designed to “harmonise” data privacy laws across Europe as well as give greater protection and rights to individuals. Across the board, financial services jobs decreased by 6%, month-on-month, suggesting a slight flattening of jobs available. In the same timeframe, job seekers were down by 21%. The significant drop was, in part, due to the two Bank Holidays and warm weather, which many used as an opportunity to take extended leave. In addition, institutions are seeking to recruit top talent directly from existing positions, instead of waiting for them to register their interest in new work. “Poaching has always been a part of the industry’s modus operandi, but it’s especially prevalent post-Brexit as businesses worry about the best and brightest leaving the City”, said Enver. A new report from TheCityUK found that if businesses cannot directly hire top talent irrespective of their nationality, they will experience a300% cost increase in hiring of non-British staff. “It’s crucial that the voices of business be heard in Whitehall and Brussels. What’s bad for British business is certainly bad for European workers, too”, said Enver. “We shouldn’t be making it any more attractive to move jobs out of London than it already is”. All eyes remain on the government’s trade deal plans that, at best, will open up and strengthen Britain’s business ties across the globe, but could also create barriers to market access for some regions. “With Washington’s on-again-off-again relationship with trade deals, it would be naive to think that the only challenge we’re facing to our access to the global economy is a good Brexit plan”, said Enver. Widespread confusion about the future continues to define Britain’s business sector. Nevertheless, the economy is performing better than it has in decades with the Office for National Statistics reporting that 75.6% of people are employed. “The focus on the fears of a bad Brexit deal is crucial to ensure a bright economic future, but it can distort the reality on the ground, which is that businesses and professionals are thriving in London”, concluded Enver. 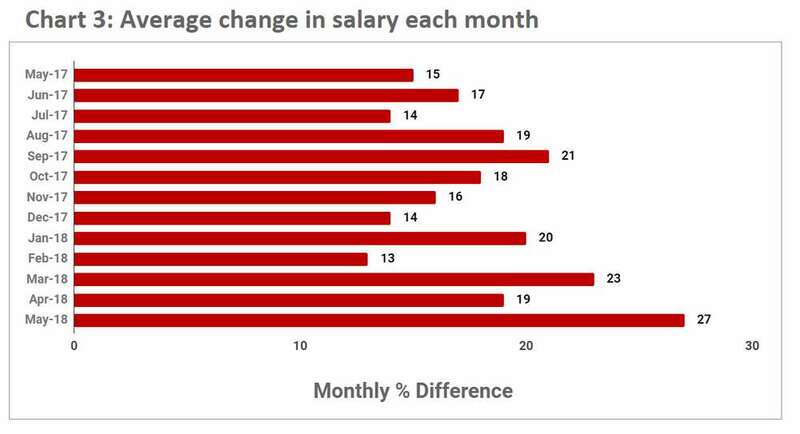 The average salary change for professionals moving to a new role increased to a high of 27% in May 2018. The last time it averaged at this level was back in December 2013. As Brexit negotiations intensify, the sharp fall in professional searching for new employment suggests concerns about committing to a new employer, particularly in this volatile climate. For those continuing to seek new employment however, are in demand, hence are expected to be paid a premium on their existing compensation.